Hayward Y-Check Valves prevent reversal of flow in piping systems. They are ideal where backflow could potentially cause damage to pumps, filters or process equipment. All Y-Check Valves have an FPM o-ring seal and seat. Threaded or Flanged End Connection is available upon request. All Spring-Loaded Y-Check Valves are suitable for both horizontal and vertical installation. 1½ valves are furnished with extra 1/2" and 3/4" threaded end connections. 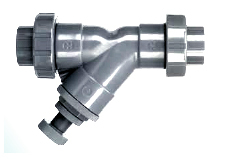 2" valves are furnished with extra 1-1/2½ threaded end connections. All Spring-Loaded Y-Check Valves are suitable for both horizontal and vertical installation. 1½ valves are furnished with extra 1/2" and 3/4" threaded end connections. 2" valves are furnished with extra 1-1/2" threaded end connections.